Growing up with an imprisoned father and an alcoholic mother, Claressa Shields and her siblings had to fend for themselves, often going hungry and sleeping on the floor. So when 9-year-old Claressa told her dad she wanted to take boxing lessons, she didn’t back down a bit when he laughed and said she was too pretty for that. Instead, she angrily retorted, “I don’t want to be a model – I want to be an athlete.” He gave in, and eight years later Claressa became the first American woman to win an Olympic gold medal in boxing. Four years later she took home another gold, making her the only American boxer – male or female – with two. 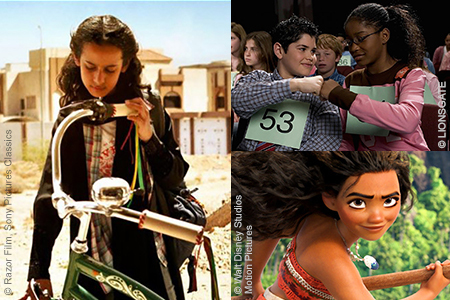 Take in one or more of the following flicks featuring strong young female protagonists – almost all available on DVD through the Miami-Dade Public Library System – for a family movie night that delivers lessons in resiliency, fearlessness and ingenuity, girl-power style. Akeelah and the Bee An 11-year-old girl stares down racism, economic disparity and self-doubt as she makes her way to a national spelling bee with the help of her South Los Angeles community. Brave When Princess Merida is told she must marry a mate chosen for her by her Scottish clansmen, the sharp-shooting archer defiantly refuses, setting off a chain of events that tests both her courage and skill. Moana The determined young daughter of a Polynesian chieftain pairs up with a disgraced demigod to save her people from a vengeful demon. Mulan Huns are invading China, compelling 16-year-old Mulan to disguise her gender and take her elderly father’s place in the army, where she quickly proves herself to be as fierce and cunning a warrior as any man – if not more so. Pollyanna (1960) A cheerfully optimistic orphan radically alters the lives of her small-town family, friends and neighbors before a tragic accident threatens to squelch her sunny, soul-soothing spirit. Wadjda A shiny green bicycle captures the heart of a young Saudi girl, who must overcome culturally ingrained gender beliefs and financial hardship to realize her dreams. Whale Rider Pai’s Maori tribe has never been led by a woman, something the young New Zealander yearns to change, and she bravely stands up to the anger, disbelief and resentment of her family and tribe members to do so. When her state’s new governor began changing voting laws, making it harder for many folks to register to vote – including teenagers, who until then could preregister – 12-year-old Madison Kimrey got mad and got going. She began reading and writing about voting rights and politics; created a blog; joined Moral Mondays, a nonviolent protest group; and started a petition asking the governor to discuss why he wanted to make it more difficult for teenagers to register to vote (and got more than 12,000 signatures for it). But the governor refused to meet with Madison and dismissed her as a “prop,” which made her even madder. Fast forward through three years of Madison advocating for voter rights to 2016, when the governor’s laws were deemed unconstitutional and overturned, reinstating preregistration. Like lots of little girls, Jazz Jennings loved dressing up in her big sister’s clothes, putting on makeup and playing with dolls. But because she was born a boy on the outside, many people – including her family – didn’t know why. Eventually, they came to understand that Jazz was transgender, meaning that even though she was assigned male at birth, she has always been a girl. And with the support of her family, friends and community, Jazz has been able to grow up as the girl she always knew she was. Others like her haven’t been as fortunate. There’s a lot of fear and misunderstanding around transgender people, who are often a target of bullying, discrimination and even violence. Jazz knows that, which is why she and her family decided to share her story in I am Jazz, a docuseries meant to help people understand people like her. The feedback Jazz has received from the groundbreaking show, especially from young lesbian, gay, bisexual, transgender and queer (LGBTQ) people who say she’s helped them come out to their parents and even saved their lives, has made the loss of privacy well worth it to this present-day trans youth advocate and spokesperson. When Hawa saw a flyer in her school promoting a slam poetry contest, she excitedly told her friends Kiran, Lena and Balkisa that it would be a chance to share their unique political/personal experiences with the community. The girls, who first met at their local Islamic Community Center, dubbed themselves “Muslim Girls Making Change” and worked for weeks creating Wake Up America, a piece about the events of 9/11 and the persecution many Muslim Americans were subjected to in its aftermath. They won the contest and went on to represent their state at the international Brave New Voices slam poetry competition in Washington, D.C. Though they didn’t take top honors there, the girls and their work were incredibly well received; they’ve since continued to write and perform together, showing other youth how poetry can be used to express intense emotion and experiences. Sophie Cruz was just 5 years old when she ran up to a visiting Pope Francis in Washington, D.C., and thrust a note in his hand that read, My heart is sad. I would like you to speak with the president and Congress in legalizing my parents because every day I am scared they will take them away from me. Sophie was born in America; her parents weren’t. They escaped violence and poverty in Mexico by coming to the United States, but because they aren’t citizens they can be deported at any time. The little girl’s plea did not fall on deaf ears – the very next day the pope addressed Congress and implored members to treat immigrants “with the same compassion with which we want to be treated.” Soon after Sophie was invited to the White House to meet President Obama, and she later became the youngest person to speak at the Women’s March in the nation’s capital. Adapted by Elisa Chemayne Agostinho from the New York Times bestselling book Rad Girls Can: Stories of Bold, Brave and Brilliant Young Women, written by Kate Schatz and illustrated by Miriam Klein Stahl. Rad Girls Can is available at online booksellers including Amazon and Barnes & Noble.